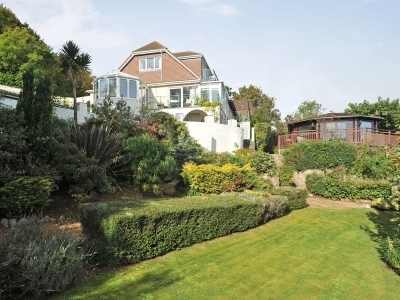 Cliff Lodge is situated on the cliff top in Torquay, enjoying spectacular views across the ocean. There are 6 bedrooms and 5 bathrooms and can sleep up to 14 people. The accommodation is luxurious. Most of the bedrooms have sea views and ensuite bathrooms. The cottage has been equipped with many facilities for leisure such as an indoor swimming pool and sauna and shower room. There is also a games room with a full-size snooker table, jukebox, sofas, plasma TV and bar. Outside there is an 8-seater hot tub, which again enjoys the amazing views. There is also a large garden and 1 acre of fields for guests to enjoy. The nearest beach is Maidencombe, which is half a mile way. It is a sand and shingle beach and is surrounded by many beautiful coastal walks. Torquay town centre is only 4 miles away.